It is September 1943 and the Red Army has begun its massive offensive against the Dniepr Line. The film describes the exploits of the Red Army and the Ukrainian citizens in defeating their occupiers and rebuilding the land. Kiev is liberated as is the rest of the Ukraine to the Carpathians and the film terminates with the Red Army crossing the Prut into Rumania. 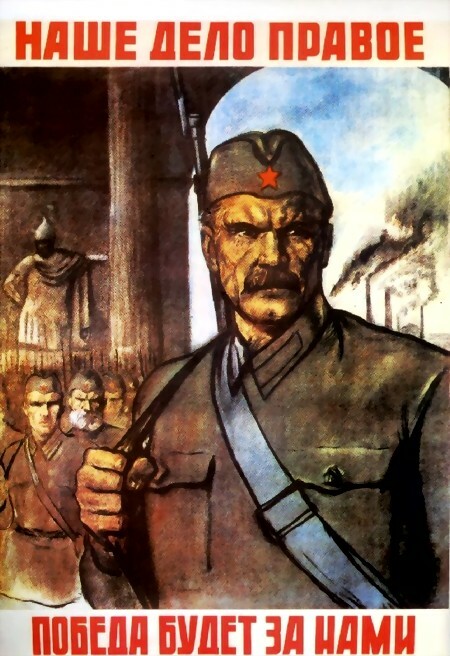 There is quite a bit more propaganda in this film and it's to be expected: in The Battle for our Soviet Ukraine, the Soviet government and the Red Army was just beginning to be optimistic about their chances of victory in the War. Stalingrad ended in February 1943 ... that was the psychological turning point of the war on the Eastern Front. But the defeat in Kursk marked the physical turning point of the War. After Kursk, there would be no major advance by the Germans and their allies on the Eastern Front again. Still, Kharkov changed hands for a third time in September and Kiev was not yet in Soviet hands. 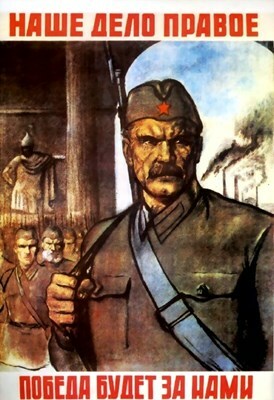 The belief in final victory was cautiously expressed in Soviet governmental circles and this is reflected in the film's tone. In Victory in the Ukraine, this tentative hesitation is nowhere to be heard. For one thing, Kiev and all of the Ukraine is now in Soviet hands. In fact, the film was made at a time when Soviet forces were well into Rumania, Bulgaria, Hungary, Slovakia and Poland. Now the tone is not only very confident; the propaganda is more strident and uncompromising in expressing total Soviet control over the Ukraine. IN RUSSIAN WITH SWITCHABLE ENGLISH SUBTITLES. DIGITAL QUALITY. SOME TINNY SOUND. APPROXIMATELY 59 MINUTES. Soviet Newsreel (August 1944): Resurgent and determined never to allow unfriendly nations to border the USSR again, the true face of Soviet colonialism shows its face in Poland in the summer of 1944, when the National Committee of Liberation is formed in Lublin. The members of the committee, made up exclusively of Polish Communists and Jews, who fled the Nazis in 1939 and sat out the war in the USSR, are, in reality, the Soviets’ version of a Judenrat: they will masquerade as patriots, but kowtow to the dictates of their Soviet masters. They are to ensure that the Polish cow wears its communist saddle and moos only when told to do so by Moscow. In this newsreel, we are introduced to the country’s new nominal rulers and are told that they, and the Polish flag brought from Moscow and now flying over “liberated” Poland, will herald a new age of an independent and just Poland. From there, the scene shifts to Lublin, where the Red Army is now in battle with the Nazis to take the city and, in the same newsreel, will liberate it. IN RUSSIAN WITH GERMAN VOICE-OVER AND SWITCHABLE ENGLISH SUBTITLES. VERY GOOD QUALITY WITH SOME PIXELLIZATION ISSUES. SOME TINNY SOUND. APPROXIMATELY 8 MINUTES. This newsreel is followed by a German one from the same time period. IN RUSSIAN WITH GERMAN VOICE-OVER AND SWITCHABLE ENGLISH SUBTITLES. GOOD QUALITY WITH PIXELLIZATION ISSUES. SCRATCHY BACKGROUND SOUND. APPROXIMATELY 6 MINUTES. Soviet Newsreel (September 1944): This newsreel deals exclusively with the battle for Praga, Warsaw’s eastern suburb, which, by film’s end, will be liberated by the Red Army. The newsreel ends with the statement, that “Warsaw awaits its liberators”. It does not state, however, that by the time this film was released to the public, the Warsaw Uprising against the Germans had begun and the Red Army sat on the banks of the Vistula and did nothing to assist. IN RUSSIAN WITH GERMAN VOICE-OVER AND SWITCHABLE ENGLISH SUBTITLES. GOOD QUALITY WITH SOME PIXELLIZATION ISSUES. APPROXIMATELY 10 MINUTES. IN GERMAN WITH SWITCHABLE ENGLISH SUBTITLES. GOOD QUALITY WITH SOME PIXELLIZATION ISSUES. APPROXIMATELY 8 MINUTES. Soviet Newsreel (Autumn 1944): General Zhukov and a number of other Soviet generals are awarded with high orders for bravery and excellence in the field. A brief report about the Lavochkin-5 and its use on the battlefield. German General Franek is captured by two 18-year olds in the forest around Warsaw and important battle plans fall into Soviet hands. A report about liberated Lithuania and the martyrdom of Marite Minikaite, a Lithuanian communist partisan. The liberation of Byelorussia is completed. The liberation of Brussels by the western Allies is also briefly shown. IN RUSSIAN WITH SWITCHABLE ENGLISH SUBTITLES. VERY GOOD QUALITY WITH SOME PIXELLIZATION ISSUES. APPROXIMATELY 7 MINUTES. IN GERMAN WITH SWITCHABLE ENGLISH SUBTITLES. VERY GOOD QUALITY WITH SOME PIXELLIZATION ISSUES. APPROXIMATELY 12 MINUTES. Soviet Newsreel (April 1945): The end of the Third Reich is now definitively at hand. In this newsreel, Fortress Konigsberg has fallen to the Soviets. IN RUSSIAN WITH GERMAN VOICE-OVER AND SWITCHABLE ENGLISH SUBTITLES. VERY GOOD QUALITY WITH SOME PIXELLIZATION ISSUES. APPROXIMATELY 6 MINUTES. This is followed by the last German newsreel made less than a month before the previous Soviet newsreel. After March 1945, the Nazis obviously felt there was nothing “newsworthy” to report from the frontlines. As far as the Third Reich was concerned; they were right. IN GERMAN WITH SWITCHABLE ENGLISH SUBTITLES. GOOD QUALITY WITH SOME PIXELLIZATION ISSUES. APPROXIMATELY 10 MINUTES. Soviet Newsreel (May 1945): This final newsreel is a report about May Day being celebrated in the Soviet Union and in the various “liberated” lands (all of them seeming, for the most part, to be gathering the most ardent celebrants from the ranks of the local Communist parties). The message in between the lines is clear: in those countries overrun by the USSR, there will be no need to ask, who’ll be running the show in the future. IN RUSSIAN WITH GERMAN VOICE-OVER AND SWITCHABLE ENGLISH SUBTITLES. VERY GOOD QUALITY WITH SOME PIXELLIZATION ISSUES. APPROXIMATELY 10 MINUTES.